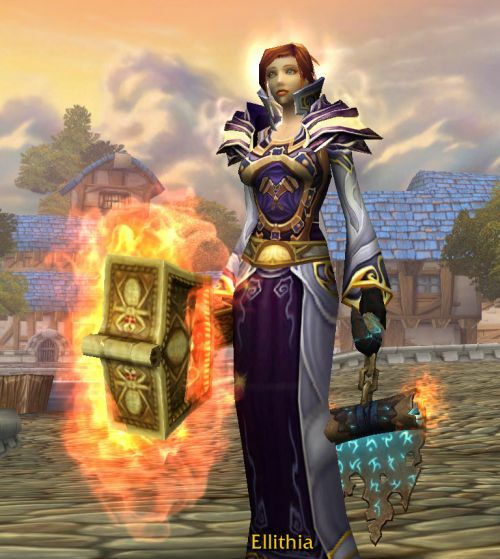 Meet The Girls: Ellithia #WoW #WorldofWarcraft – Nomadic Gamers, eh! If I had a main in World of Warcraft, this would be her. Ellithia is my discipline priest, off spec flutters between holy and shadow depending on my mood. Discipline is great for single target big heals (ie: 5 man dungeons) and I use holy for raids (AoE heals). Shadow I use just when I’m out questing on my own though I am thinking of giving it up and having two heal specs instead. Her professions are tailoring and enchanting, which is pretty typical for a priest because they are independent of one another and priests wear cloth. I’ve managed to max out all her other professions, and I have the most achievements on this character. Even finished archaeology which took forever (but was also a lot of fun). Over 50 mounts, 95 pets, it’s the character I’m most ‘proud’ of and have put the most work into. I also spend a lot of time PvPing on this character, despite what a lot of people think, I do enjoy this aspect of WoW and always have. I’m even good at it. Ellithia has a pretty boring background story. Both of her parents are hard working citizens of Stormwind City, and Ellithia was able to make the choice to become a priest on her own without any pressure. Her mother and father both love her with all of their hearts, and have never judged her or made her feel like less of a person. In fact they are incredibly proud of their daughter and all she has accomplished. Ellithia had a younger sister who was killed in a very unfortunate accident involving a cauldron of molten lava, but her family doesn’t speak about it. Her picture is kept on the mantle, where the family can see her every day. Ellithia spends most of her days with her best friend Toargo, who is a dwarven warrior from Ironforge. They’ve been friends for a number of years now, and often fight the evils of Azeroth together, their latest conquests have taken them right before Deathwing where they of course emerged victorious.